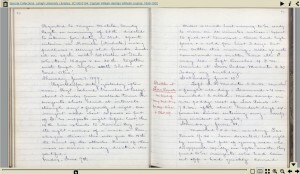 Click the image to view the diary in a page-turning viewer. Photocopy of 95 page typescript, in binder, with illustrations, including photo of Silge. The binder has a sticker on the front reading: Mein Tagebuch / by Arno Silge. The story of a German immigrant who makes an ‘illegal’ & difficult trek into the U. S. A. via Mexico in 1922. Written in German. There is also a title page, reading: Mein Tagebuch, St. Louis, Mo., September 1922. 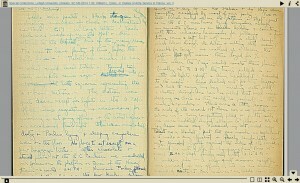 The beginning of the diary is dated 17 July 1921; and there is a postscript dated 6 June 1984 (p. 69). In 1921, Silge traveled to Mexico, via Amsterdam and Spain, in the hope of gaining entrance to the United States to see his brother: “Mein Plan war, nach Amerika zum Bruder zu gehen. Da es nicht möglich war, eine Einreiseerlaubnis vom Amerikanischen Konsul zu erhalten, so wollte ich über Mexico mich einschmuggeln oder versuchen, dort die Erlaubnis zu erhalten” (p. 4). The narrative begins in Saale. Except for the photo of Silge, the illustrations pertain to Mexico. The diary apparently ends when he was jailed in El Paso. The postscript says that he spent three weeks in prison in El Paso; wrote to his brother Walter, in Chicago, and his father, in Jacksonville, who in turn wrote to their senators, and to President Harding; and then he was released when a report arrived saying that he was an American citizen and should be released. Click image to view the document in a page-turning viewer. A locally produced history of one hospital train and its crew, and its origins in Pennsylvania. Contains many photographs. Estelle Johnston (1867-1952) was a daughter of the prominent Bethlehem, Pennsylvania timber merchant family Brown-Borhek. She married Archibald Johnston, a Bethlehem Steel Company executive and the first mayor of Bethlehem on February 12, 1891 in the Central Moravian Church. They had three children, only two which survived. 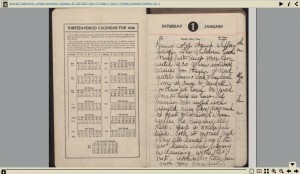 Estelle’s diary details her daily activities in 1947, including her mounting concern for the health of her husband. Estelle Johnston (1867-1952) was a daughter of the prominent Bethlehem, Pennsylvania timber merchant family Brown-Borhek. She married Archibald Johnston, a Bethlehem Steel Company executive and the first mayor of Bethlehem on February 12, 1891 in the Central Moravian Church. They had three children, only two of which survived. Estelle’s diary details her daily activities in 1938. William Herman Wilhelm (1867-1901) was born in Mauch Chunk, Pennsylvania, the son of James Henry and Martha Weaver Wilhelm. He was educated at Ulrich’s Preparatory School in Bethlehem, Pennsylvania and then went on to Lehigh University in 1883. Wilhelm left Lehigh for the U.S. Military Academy and graduated from there in 1888. When war was declared against Spain, he became aide-de-camp to Brigadier-General Simon Snyder and accompanied him with the Army of Occupation to Cuba. In 1899 Wilhelm was promoted to Captain with orders to proceed to the Philippines and was assigned to the 21st Regiment of Infantry as Captain in Company B. The material in the diary details Wilhelm’s experiences fighting in the Philippine-American War (1899-1902). The diary is a copy of the original, and was created by Wilhelm’s cousin, Ethan Allan Weaver. The diary begins November 28th, 1898 when Wilhelm leaves Knoxville, Tennessee by train for Savannah, Georgia to board his transport ship the “Manitoba” bound for Cuba. 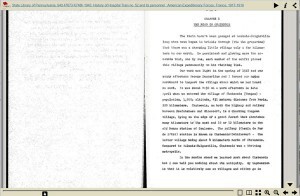 His notes during his time in Cuba with General Snyder are written in Spanish. Upon his arrival in New York, April 5, 1899 he returns to the use of English for the remainder of his diary which ends June 7, 1901. According to Weaver, Wilhelm was mortally wounded in action near Lipa, Batangas Province, Philippines on June 10, 1901. Captain Wilhelm died June 12, 1901. 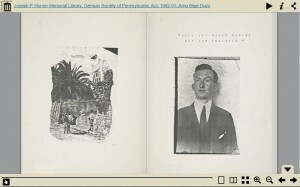 His body was returned to Mauch Chunk via Manila for burial and presumably his journal accompanied his body where it came into the possession of Weaver. William Estes, Jr. was born and raised in Bethlehem, Pennsylvania. He graduated from Moravian Parochial School, Lehigh University (1905), Johns Hopkins Medical School (1909), and was a resident in surgery at the Mayo Clinic (1909-1912). Estes served as an Army surgeon in France (1918-1919); was a respected surgeon in Bethlehem, and was the chief surgeon at St. Luke’s Hospital from 1929-1950. He was also President of the State Medical Society, the American College of Surgeons, and the American Association of the Surgery of Trauma. Estes was a leader in community activities. He was President of the Bach Choir from 1942-1961, an active Episcopal churchman, and an avid fisherman. 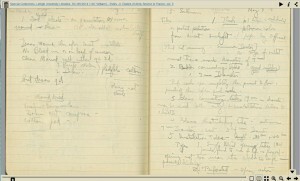 This six-volume diary traces Estes’ time in Europe as an Army surgeon during WWI. The sixth and final volume begins on March 4, 1919 and ends on May 5, 1919. William Estes, Jr. was born and raised in Bethlehem, Pennsylvania. He graduated from Moravian Parochial School, Lehigh University (1905), Johns Hopkins Medical School (1909), and was a resident in surgery at the Mayo Clinic (1909-1912). Estes served as an Army surgeon in France (1918-1919); was a respected surgeon in Bethlehem, and was the chief surgeon at St. Luke’s Hospital from 1929-1950. He was also President of the State Medical Society, the American College of Surgeons, and the American Association of the Surgery of Trauma. Estes was a leader in community activities. He was President of the Bach Choir from 1942-1961, an active Episcopal churchman, and an avid fisherman. 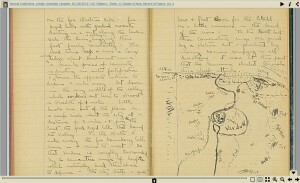 This six-volume diary traces Estes’ time in Europe as an Army surgeon during WWI. The fifth volume begins on February 5, 1919, and ends on March 4, 1919. William Estes, Jr. was born and raised in Bethlehem, Pennsylvania. He graduated from Moravian Parochial School, Lehigh University (1905), Johns Hopkins Medical School (1909), and was a resident in surgery at the Mayo Clinic (1909-1912). Estes served as an Army surgeon in France (1918-1919); was a respected surgeon in Bethlehem, and was the chief surgeon at St. Luke’s Hospital from 1929-1950. He was also President of the State Medical Society, the American College of Surgeons, and the American Association of the Surgery of Trauma. Estes was a leader in community activities. He was President of the Bach Choir from 1942-1961, an active Episcopal churchman, and an avid fisherman. This six-volume diary traces Estes’ time in Europe as an Army surgeon during WWI. The fourth volume begins on December 23, 1918 and ends on February 4, 1919. William Estes, Jr. was born and raised in Bethlehem, Pennsylvania. He graduated from Moravian Parochial School, Lehigh University (1905), Johns Hopkins Medical School (1909), and was a resident in surgery at the Mayo Clinic (1909-1912). Estes served as an Army surgeon in France (1918-1919); was a respected surgeon in Bethlehem, and was the chief surgeon at St. Luke’s Hospital from 1929-1950. He was also President of the State Medical Society, the American College of Surgeons, and the American Association of the Surgery of Trauma. Estes was a leader in community activities. He was President of the Bach Choir from 1942-1961, an active Episcopal churchman, and an avid fisherman. This six-volume diary traces Estes’ time in Europe as an Army surgeon during WWI. The third volume begins on October 31, 1918 and ends on December 23, 1918. William Estes, Jr. was born and raised in Bethlehem, Pennsylvania. He graduated from Moravian Parochial School, Lehigh University (1905), Johns Hopkins Medical School (1909), and was a resident in surgery at the Mayo Clinic (1909-1912). Estes served as an Army surgeon in France (1918-1919); was a respected surgeon in Bethlehem, and was the chief surgeon at St. Luke’s Hospital from 1929-1950. He was also President of the State Medical Society, the American College of Surgeons, and the American Association of the Surgery of Trauma. Estes was a leader in community activities. He was President of the Bach Choir from 1942-1961, an active Episcopal churchman, and an avid fisherman. 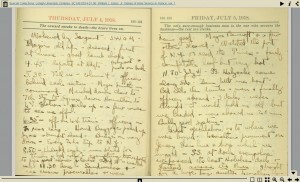 This six-volume diary traces Estes’ time in Europe as an Army surgeon during WWI. The first volume of the diary begins on July 3, 1918, when Estes reports for duty in Allentown, Pennsylvania and ends on August 4, 1918 in France. 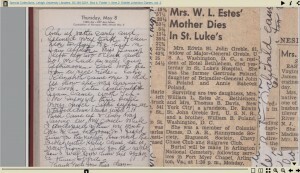 Although the diary contains printed dates, Estes did not generally follow them. 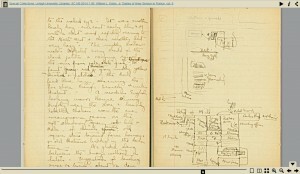 In addition, in much of first volume, Estes has written his entries on sheets of paper and pasted them directly over the original diary pages.